Toukiden was one of the titles announced for both the PSP and PS Vita at last month's SCEJ (Sony Computer Entertainment Japan) Press Conference. 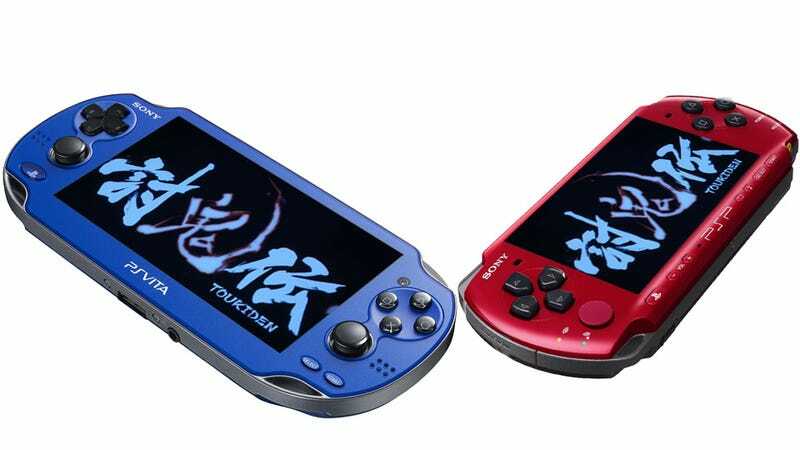 A couple of the title's biggest selling points are that it is being developed as a collaborative project between SCEJ and Tecmo Koei, and that the game will have cross-platform capabilities between the PSP and the PS Vita. But just what is the game about? In an interview with Weekly Famitsu SCEJ president Hiroshi Kawano and Tecmo Koei games Toukiden general producer Hisashi Koinuma talked about the new project. Headed by the Omega-Force development team, well known for the Dynasty Warriors series and other "one-versus-massive numbers of enemies" games, this will be an entirely new title that, according to Koinuma, "will take an entirely different direction in action from the Warriors games. You will be able to feel the thrill of crushing, piercing, slashing, and other actions." Koinuma described the game as an action game set in world with its own Japan and history where players must battle different types of powerful demons (Oni). Not that it was a vague description, but even without seeing the trailer that played at the SCEJ press conference, that much could be derived from the title itself, which, roughly translated, literally means "Demon Hunting Tale." The game is currently scheduled for release in 2013, but the developers have assured that they don't intend to make people wait around for an entire year until it hits the shelves. With Sony's direct involvement with development, it's unlikely we'll be seeing it on any other consoles. While the game will playable in single-player mode, the biggest draw will be the multi-player. Sony will be putting a lot of effort into showcasing the cross-platform ability for PSP users and PS Vita users alike. Hmm… An action game with different types of giant monsters that has heavy emphasis on multi-player, and has the word "hunt" in the title… I sincerely hope this doesn't end up as another Monster Hunter clone. Although, if it does, after what happened with Monster Hunter it would make sense that Sony is closely involved.